They worked in 3 teams of 7 and one team of 8 (yes, 29 students in my Reading class. Sigh.) Each group was given a stack of 12 books. Aside: I'd like to tell you that I pain-stakingly pulled together the 12 books for each group, but that would be a lie. The original 48 titles came about as I looked on my son's shelf at home and pulled 50 of my favorites for World Read Aloud Week for students to choose from for reading to younger students. Every team member had to read all of the books. Together, they ranked them from 1-12. We then created 4 brackets. The teams then switched stacks several times…bottom line is every student had to read all 48 books before the voting could begin. Books 1-4 in all 4 brackets received an automatic bye. Round 1 Voting consisted of me announcing the pair ups to the class and everyone receiving a ballot to vote. 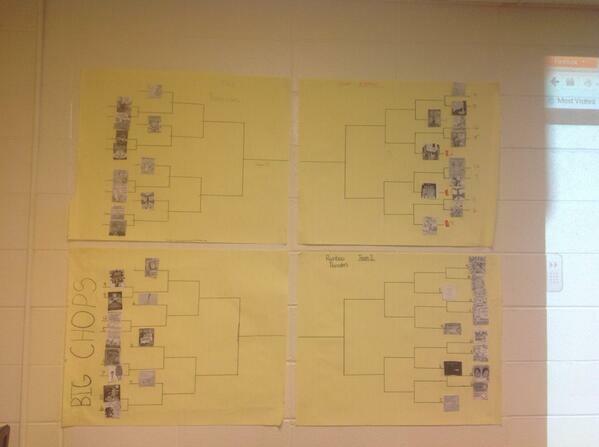 Votes were tallied the next class period and books were moved on to the next round. 2 More Rounds of voting to go... stay tuned! I’d love to do this library or school wide with top checkouts, but I can’t seem to get organized to pull off our high school battle of the books (and county competition) plus our middle school battle of the books all in March AND library book bracketology.